Fast, Fun, Visual Magic! Use it anytime you have something signed! 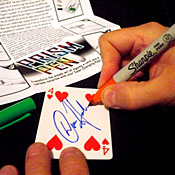 Transform the simple act of signing a card into a curious surprise with your Color-Changing Pen! A BLACK marking pen changes color with a wave of your hand. When the cap is removed, the pen is another color. When your spectator writes, it's a third color! The pen may be examined. Includes: Fully Illustrated Instructions which detail the fun and versatile "Dagger Move" as perfected and performed by Harlan. Specially prepared Prism Pen gimmick ready to use straight out of the package.